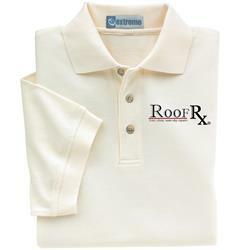 Men's Extreme Cotton Blend Pique Polo shirt with the RoofRX logo embroidered. Matching flat knit collar and cuffs. A great everyday polo shirt. Available Colors: Natural with RoofRX embroidery included. Production Times Available: 3 working days. Rush Available. Typical Imprint Area(s): Front Left Chest. Available Imprint Options: Embroidery Gift Wrapping and more.